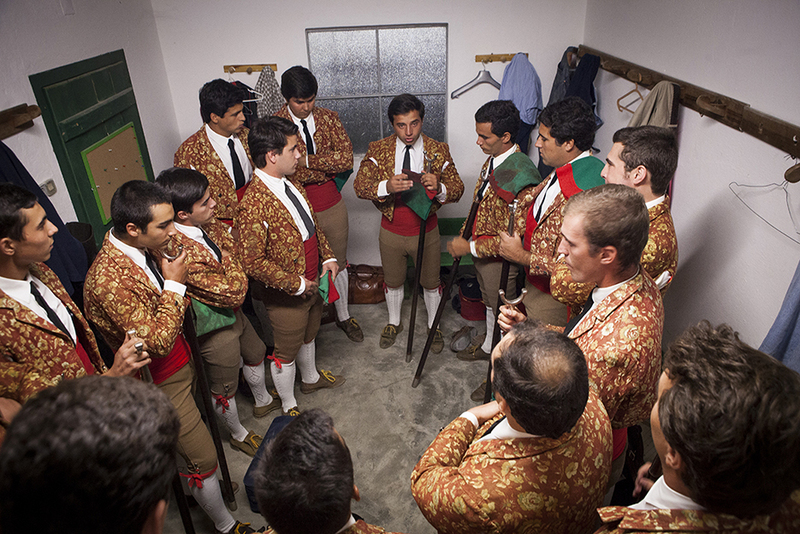 Portuguese Forcados lie somewhere between the bull riders of the Americas and the bloodier bullfighters of Spain. 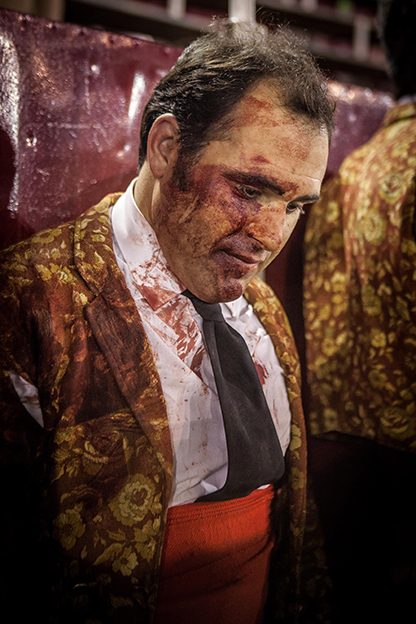 Unlike in Spain, where the bull is stabbed to death if the matador manages to win the contest, the forcados wrestle the animal (whose horns are capped) with their bare hands as a display of determination and bravura. 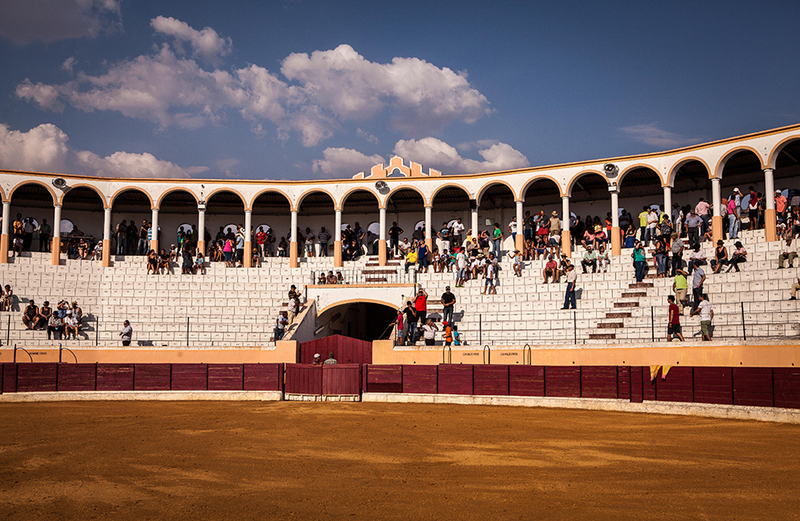 The Spanish recently moved to permanently legalize deadly bullfighting (after the region of Catalonia outlawed it), but in 1836 Portuguese royal law banned the killing of bulls in the arena. While few can say the bull enjoys the “fight”, in the Portuguese arena at least, he is protected and will live to see another day. 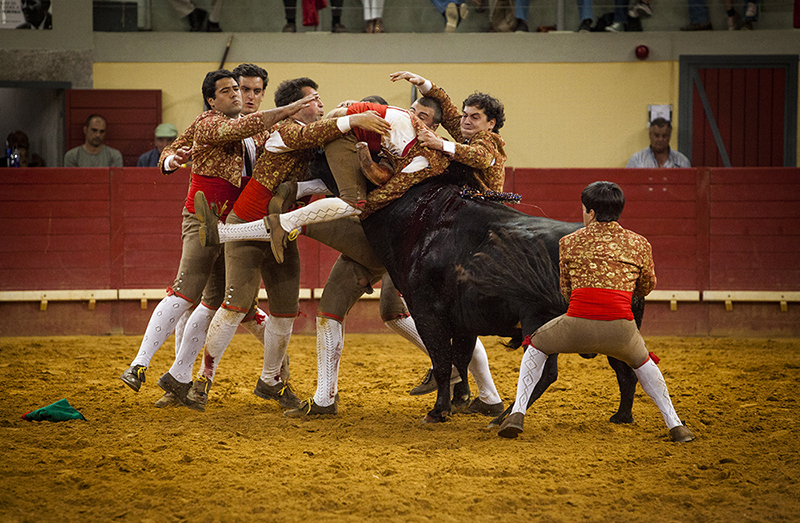 Usually, a group of eight Forcados challenge the bull in concert. 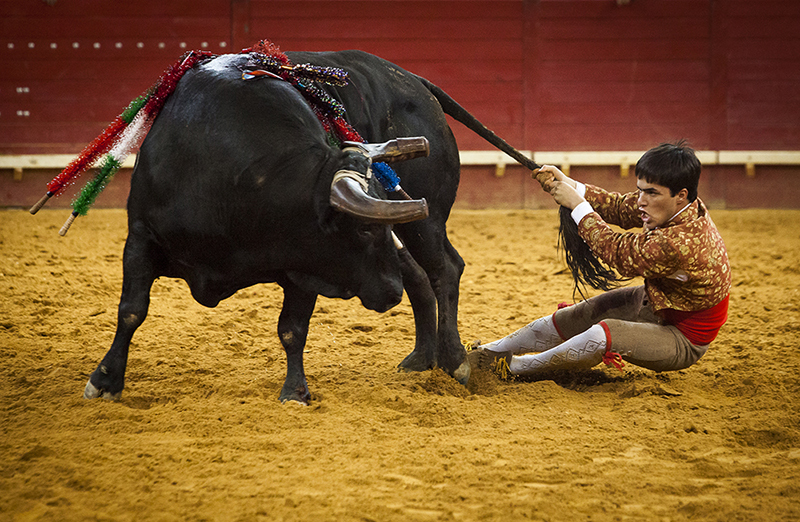 The front man provokes the bull into a charge so that he can perform a pega de cara – face catch. He secures the bull by its neck or horns and must remain on the bull’s head until the other members of the group can restrain the animal, enabling the man to extricate himself. The team’s rabujador then holds on to the tail to finish off the performance. 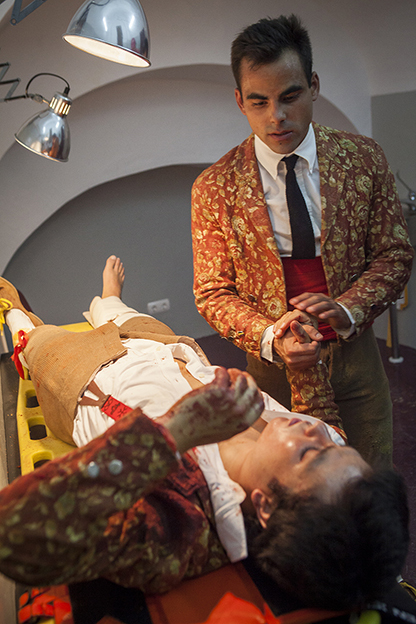 Dressing for the bullfight: Forcados from the group of Évora gets help to put a 5 meters red waistband that protect their internal organs from the attack of the bull, Reguengos de Monsaraz, Portugal. 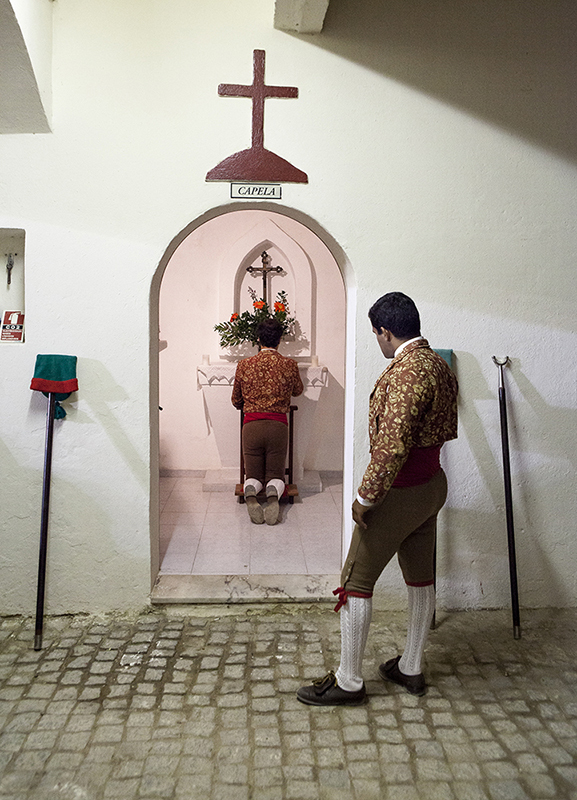 Praying for protection: Guga Oliveira, one of the members of the group of Forcados of Évora looks to another member of the group praying before the bullfight, Alcochete Arena, Portugal. 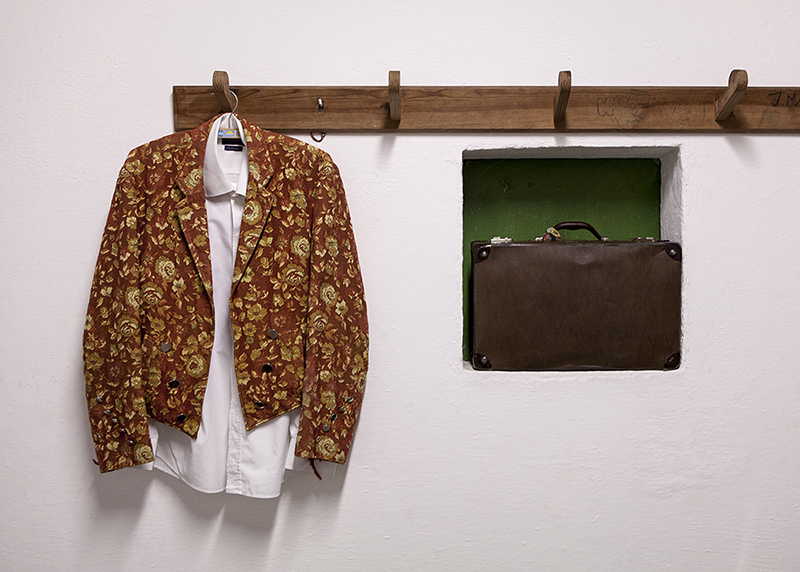 Forcados jacket: The ‘jaqueta’, a forcado’s jacket seen in the dressing room before the bullfight in Valverde, Portugal, 3rd August 2013. The jacket distinguishes each group from a another because of the different fabrics and patterns. 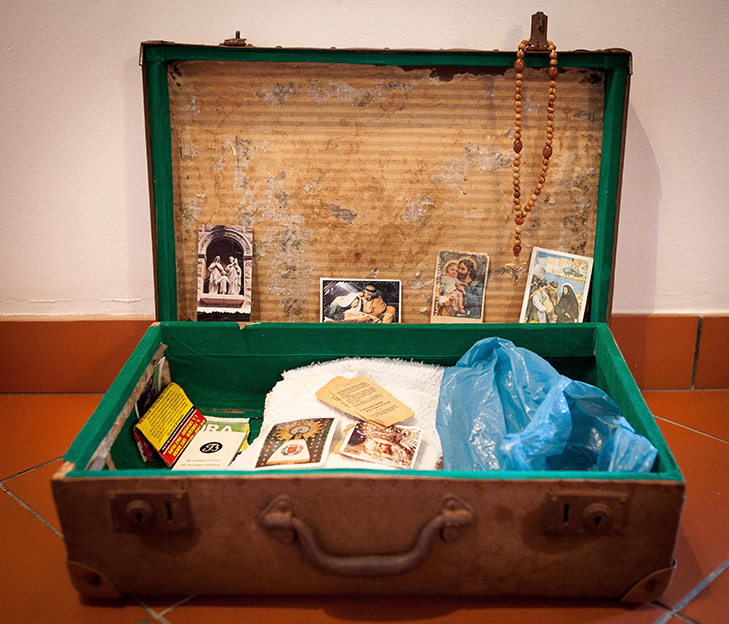 It is also extremely important for the forcados since it passes from generation to generation. Blessings before wrestling the bull: Before each time a the group enters in the arena to face the bull forcados performe a small blessing. Forcados groups are extremely religious. Reguengos de Monsaraz, Portugal. 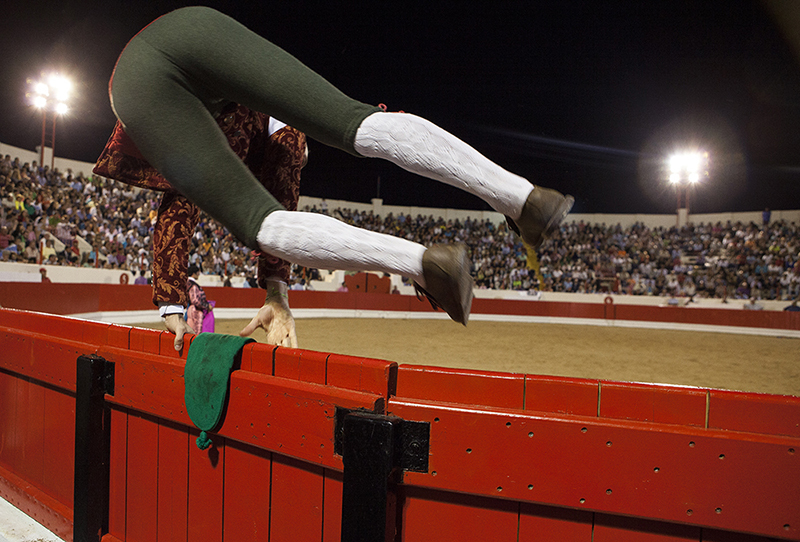 Jumping the trenches: Forcado jumps the trenches to enter in the arena. 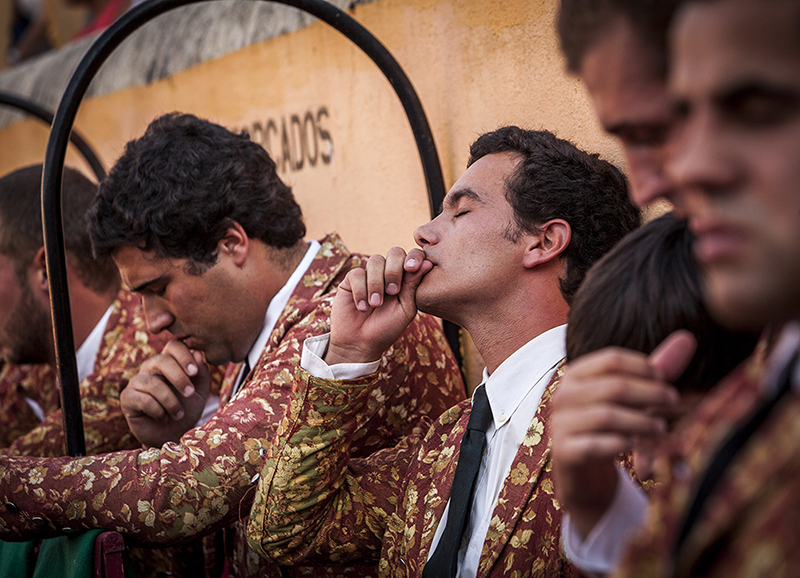 They try to make it as artistic as possible, since its one of the most important rituals before the ‘pega’ or head catch of the bull, Alcochete Arena, Portugal. The face catch: A member of the Évora forcados performes a face catch at Barbarela style, grabbing the bull by the neck, Reguengos de Monsaraz, Portugal. 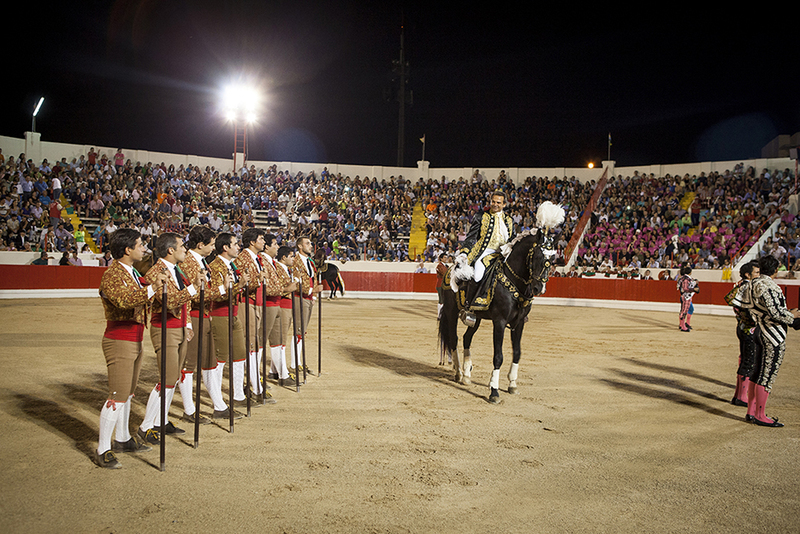 The Reunion: Forcado leads the bull after the ‘pega’ or face catch and is helped by the rest of the group on the Évora Arena, Évora, Portugal. 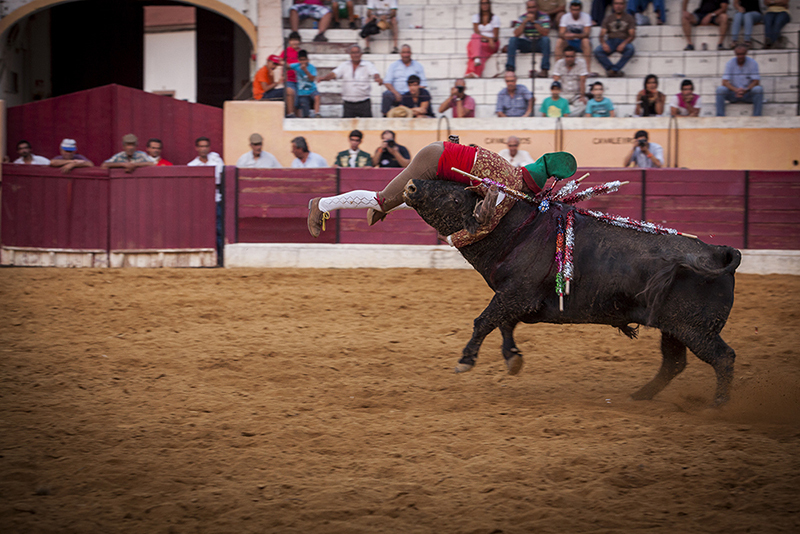 Rabujador closes the performance: João Madeira, member of the Forcados group of Évora, acts as the ‘rabujador’ pulling the tail and riding in circles with the bull to close the performance, Évora arena, Portugal. 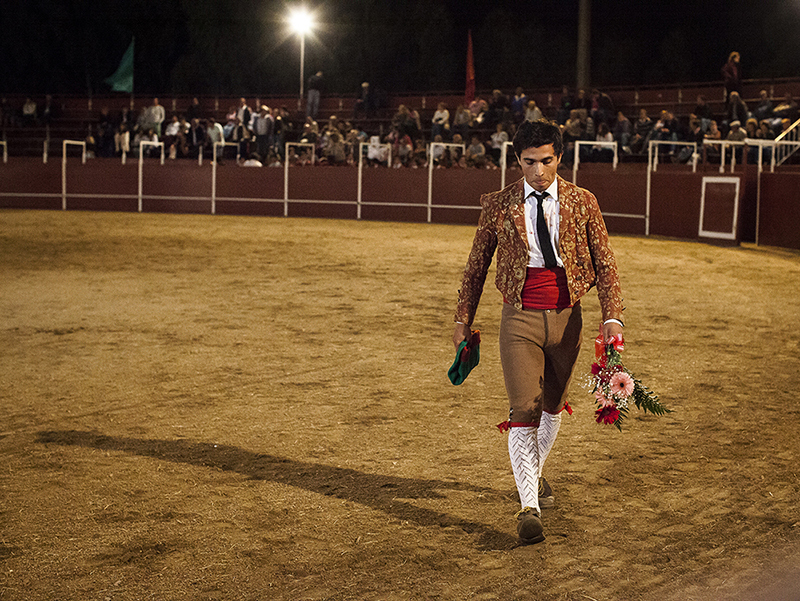 Salutes from the public: Dinis Caeiro a member of the Forcados of Évora group, leaves the arena after a successful ‘pega’ or face catch. When the pega is done at the first attempt and with style the forcados goes around the arena to receive applauses and flowers from the public, Entradas, Portugal. 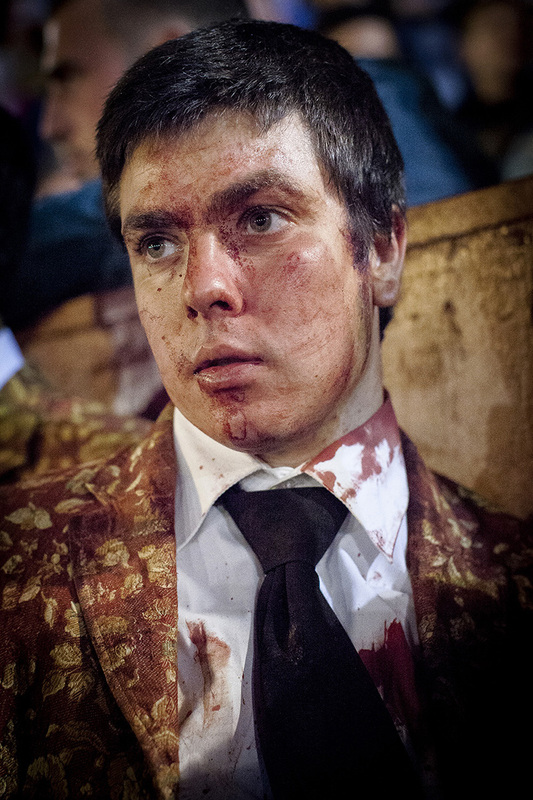 After the fight: José Martins, member of the Forcados of Évora is lost in thoughts after a difficult catch of the bull. He only did it after three attempts, Entradas Arena, Portugal. 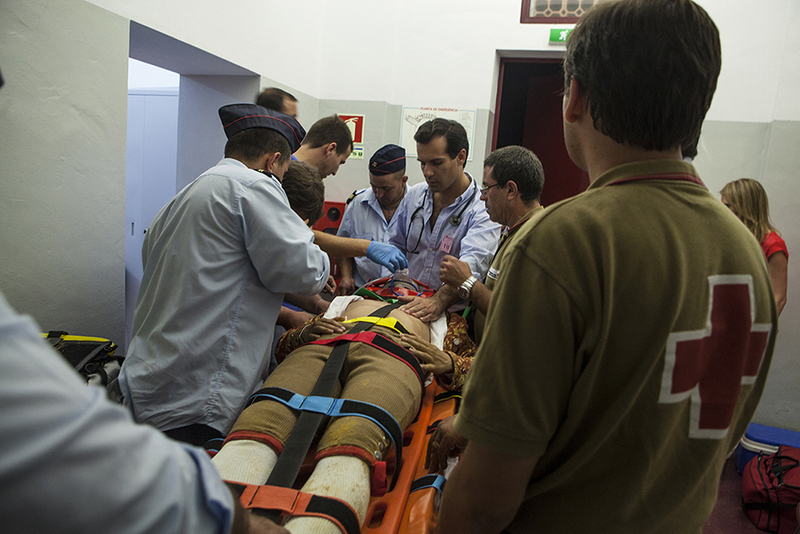 A broken leg: José Martins, member of the group of Forcados of Évora broke his leg after an attempt to wrestle the bull in Redondo, Portugal, 9th August 2013. 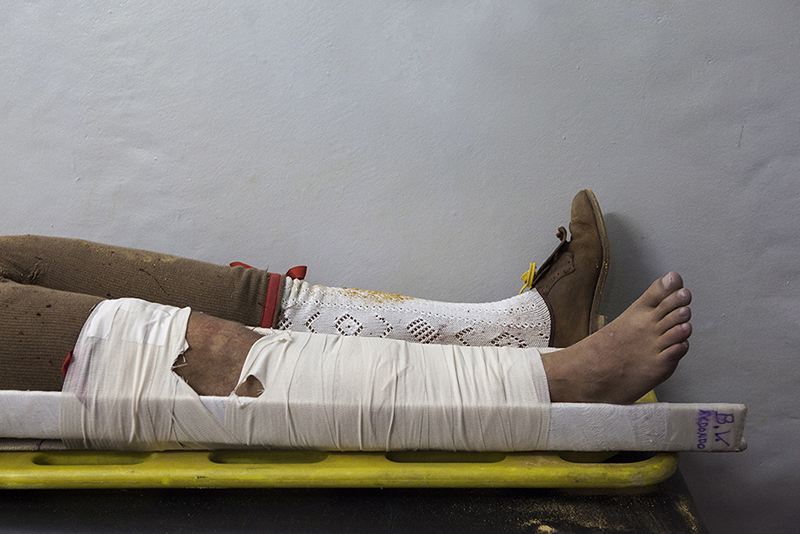 Forcados get frequent injuries during their career, from broken limbs to more serious injuries like lifelong disabilities or even death. 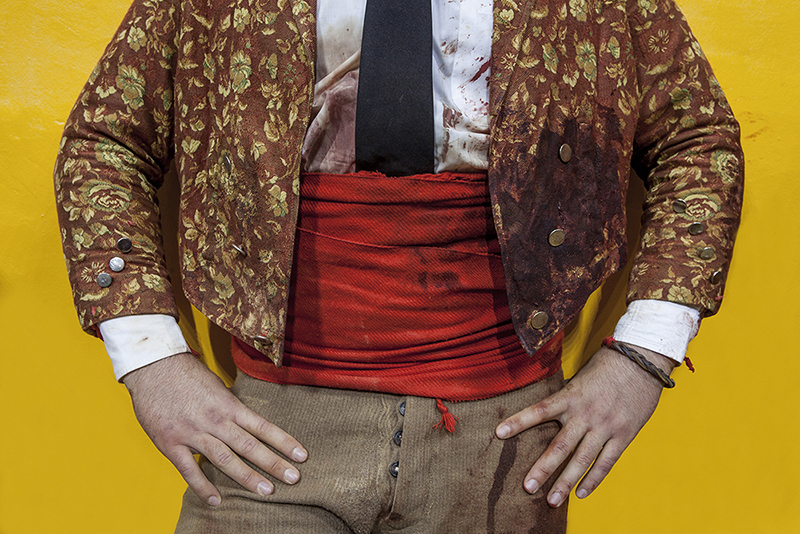 Forcados jacket after wrestling the bull: Detail of the forcado jacket after the ‘pega’ or face catch, Redondo Arena, Portugal.